Throughout Majora’s Mask, you are confronted by an interesting character; the Happy Mask Salesman. Your knowledge of him during the game is very little, and he seems to show more evil than he does good. In this article, I will show instances of both the good – and the evil – of the Happy Mask Salesman. 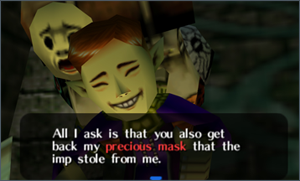 One of the more interesting things about the Happy Mask Salesman is that he is the same person from Ocarina of Time, who requested that you go around selling his masks for him. It’s proven when he says: “I own the Happy Mask Shop. I travel far and wide in search of masks…” Quitting that livelihood, he seems to have traveled to Termina, or perhaps he had only been visiting Hyrule to look for something – or someone. Link meets the Happy Mask Salesman after being turned into a Deku Scrub by the Skull Kid. Sounds like a fair trade, yes? So of course, Link does retrieve the item that was stolen from him – the Ocarina of Time – and the Happy Mask Salesman turns Link back to normal. But that’s all the good he does. When he realizes that Link doesn’t have Majora’s Mask, he grows angry. Displaying abnormal behavior, he shakes Link’s shoulders to emphasize how dire the situation is. Moments before, he was very calm and even taught Link a song to restore him to normal. Is his kindness his true personality, or is it all an act? Surely he wouldn’t have a fit like this if he were being truthful to Link. He must be hiding something – or many things – from Link. “I’m sure you’ll find it right away,” is what the Happy Mask Salesman tells Link when he asks for the Ocarina of Time and Majora’s Mask. You wouldn’t expect him to mean “right away” literally, but when Link retrieves the Ocarina and reverts time back to just after he exited the Clock Tower, the Salesman is hardly surprised that Link seems to have just walked outside and then right back in with the Ocarina of Time. It’s as if he actually knows the capabilities of the instrument. The “Three Day Timer” is first started by the Happy Mask Salesman when he says: “Except… the one thing is… I’m a very busy fellow… and I must leave this place in three days. How grateful I would be if you could bring it back to me before my time here is up…” What he didn’t tell Link is that at the exact time that he is going to leave, the Moon will crash and kill everyone. “You have met a terrible fate, haven’t you?” This is spoken by the Happy Mask Salesman when he first meets Deku Link, but also after the Moon crashes down on Termina. Following the Moon’s collision and the quote, there is laughter – presumably that of the Happy Mask Salesman. The quote and laugh from him are more examples of something abnormal – he should be dead. This means that the Happy Mask Salesman doesn’t actually die when the Moon falls. Aside from that, while you’re out on your adventure to retrieve Majora’s Mask, he remains inside the Clock Tower. He said he was busy, but why is he not out selling masks? He’s a mask salesman after all, and surely someone would like to buy a mask from him for the upcoming Festival of Time. And how exactly does he know so much about Majora’s Mask? Only the Ancient Tribe knew of the mask’s power. However, they vanished (although, the Japanese dialogue says they were destroyed) so nobody should know of its power. But the Happy Mask Salesman does. How is that possible? This must mean that he was part of the Ancient Tribe. That also means that he’s lying. What does he have to gain from lying to Link? A normal person would have no reason to, but the Happy Mask Salesman is no ordinary person. The Ancient Tribe vanished according to the English translation, and while the Japanese version says they were destroyed, the Happy Mask Salesman did not divulge any information as to how they may have been destroyed. Being destroyed doesn’t necessarily mean they were killed; the tribe itself may be all that was destroyed, the people simply disbanding and going their separate ways. Possibly there were arguments over what to do with the mask. The Ancient Tribe eventually sealed the mask in shadow forever (unless the Salesman was lying about that as well), and once the mask was gone, they all could have left and lived out their lives. Wanting to salvage what he once had – provided of course that he was telling the truth when he said they sealed the mask away – the Happy Mask Salesman retrieved Majora’s Mask. Ridden with anger, he used the mask in an act of desperation: reunite the Tribe that left him all alone with the mask, a memento of what they once were. The Happy Mask Salesman presented us with a small glimpse at his mind when he grew furious at Link’s failure to retrieve the mask. He yelled, held his hands to his temples, and even shook Link violently. Saying the Happy Mask Salesman is mentally unstable is more than just conjecture. Perhaps he is bipolar, or has separation anxiety from the Ancient Tribe, but his mood swings seem to show sides of him that Link should fear; the Happy Mask Salesman once held a mask capable of destroying Termina, and had the anger to use it again without a second thought. But how could a single man reunite a tribe scattered across the land of Termina? The answer was simple for him; create a need for them to come together once again. But what could bring them together? The one thing that broke them apart: Majora’s Mask. Such an act would be difficult for him, for he was but a man; if he wore the mask, he’d be taken over by the power of Majora. The only possible way for him to execute his plan was by having a “host” wear the mask and carry out his will. Then the Skull Kid presented himself to the Happy Mask Salesman. On his way through the woods, the Happy Mask Salesman was mugged by the Skull Kid – the same one that bought the Skull Mask from Link in Ocarina of Time. Why would he want the mask? Both the Skull Mask and Majora’s Mask have a common trait: they are both intimidating in appearance. 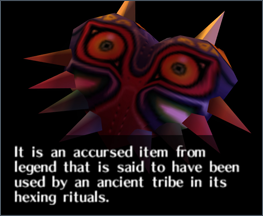 Having a fixation upon that trait, Skull Kid decided he wanted the mask even if he had to use force. With the mask in Skull Kid’s hands, the Happy Mask Salesman was able to execute his plan, with the Skull Kid as the puppet. Another possibility is that the Happy Mask Salesman was testing Link’s abilities. There must be more of a reason for him to follow Link other than to return him to his former self. 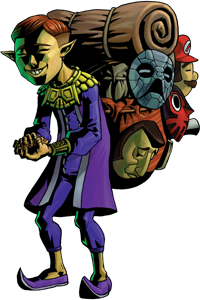 Once Link completed the mask trading sidequest in Ocarina of Time, the Salesman probably set out for Termina. As he walked through the woods, Skull Kid came along and took Majora’s Mask. From there, he got Link involved and his test began. The test would be very simple. Could Link recover Majora’s Mask? Failure meant certain death. Success meant Majora’s Mask was returned to its rightful owner – the Happy Mask Salesman. The Happy Mask Salesman knew of Link’s ability firsthand from Link selling masks for him, and he needed a person capable of defeating the demonic entity, Majora. This would require skill, cunning, and most of all, courage. Cunning was required so Link could maneuver through the puzzle-filled dungeons and free the Four Giants – the only ones capable of stopping the Moon’s final blow to Termina. Skill was important as well; Link gets his hands on many new items and must be readily able to use these weapons against deadly enemies. Courage may be the most important quality for this task; one must be able to stand against Majora and defeat him without faltering. Link possessed each of these qualities, making him a prime choice for the test. Clearly, Link did not fail – if he had, he’d return to the dawn of the first day, probably another trick of the Happy Mask Salesman. Recovering Majora’s Mask in the end, Link passed the Happy Mask Salesman’s test. But both theories – the plot to reunite the Ancient Tribe and the deadly test – seem to entwine together. They go hand-in-hand for one reason: Link’s success would bring the Tribe together again, the Happy Mask Salesman’s true desire and motivation. The Tribe would then understand the dangers of the mask. They would see how such a powerful relic from their society could demolish an entire land in a span of three days, and they would be forced to unite once more as the Ancient Tribe and make it their life’s work to protect the Mask from any form of danger or from falling into the wrong hands. Link’s quest to save Termina would be fulfilled and the Happy Mask Salesman’s wish to be with the Ancient Ones again would come true. This final quote, spoken by the Happy Mask Salesman once Majora’s Mask was returned to him and before he disappeared into thin air, was perhaps not meant for Link’s ears. Maybe it was for the Ancient Tribe’s. These words show his sorrow towards the destruction of the Ancient Tribe. After the disappearance of the Tribe, the Happy Mask Salesman created a plot to bring them back. This plan required two things: A puppet and a person to save Termina. Skull Kid and Link were the unlucky ones to take on these roles. We may never know much more about the Happy Mask Salesman, but we do know that his appearance in Majora’s Mask may have had a much bigger impact on the story of the game than we ever realized.